Place the porcini and boiling water in a heatproof bowl and set aside for 10 minutes or until the mushrooms have softened. Heat 1 tablespoon of the oil in a large saucepan over medium heat, add the onion and garlic and cook for 3–4 minutes or until soft. Add the freekeh and lemon thyme and cook for a further 2–3 minutes. Increase the heat to high and add the stock, porcini and soaking liquid, and cook, covered with a lid, for 30 minutes. Remove lid and cook, stirring occasionally, for 30 minutes or until tender. Heat the remaining oil in a large frying pan over high heat. Cook the button, oyster and enoki mushrooms, in batches, for 2–3 minutes or until tender and golden. 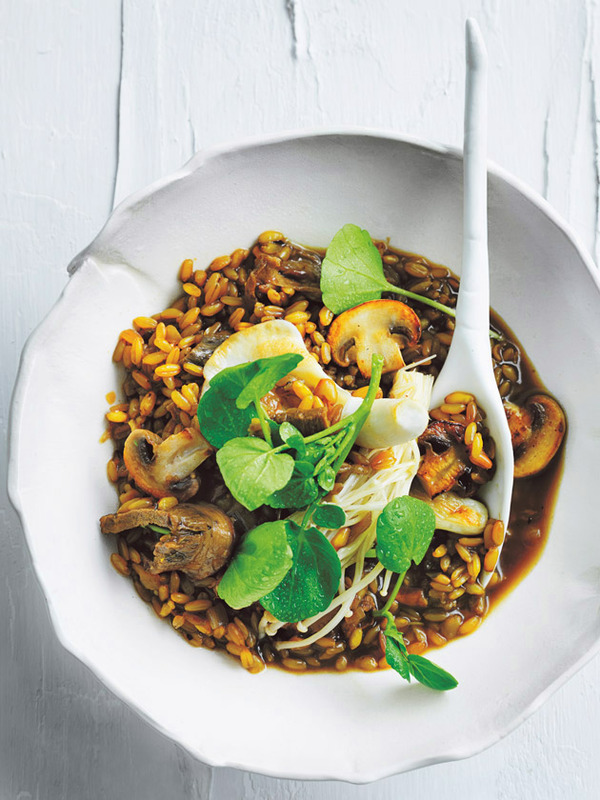 Divide the freekeh risotto between 4 bowls, sprinkle with salt and pepper, top with the mushrooms and watercress to serve. Serves 4. + You can also use the same amount of cracked freekeh for this dish, which will cook faster and have a creamier result. Find cracked freekeh in supermarkets and health food stores.